This probably never happens to you. You buy fresh cilantro (or parsley or basil or whatever herb you think you need) at the grocery store. You come home and stick it in the vegetable drawer in your refrigerator. Two weeks later you throw away the plastic bag of green slime. It occurred to me several months ago to ask the Internet how one ought to store fresh herbs. Bring home the bunch of whatever you bought. Cut an inch off the bottom. Put it in a glass of water. Put the plastic bag OVER the top of the bunch. (I don’t know why). Put it in the fridge. (I advise in the corner on the top shelf to help the glass stay upright.) Use what you need from time to time, change the water, and return it to the fridge. It stays fresh for weeks! How does this save hundreds of dollars per year? Well, when you are having tacos or spicy Asian soup and you need cilantro but your cilantro has turned to sludge – what do you do? You either give up on cooking and order in a $20 pizza. Or you drive out to your grocery store (gas is not free). While you are at the store you pick up a few more things you need. Voila! Hundreds of dollars per year needlessly spent because you do not have fresh herbs at hand. Also, here is another way to save money on cilantro the way I did just yesterday. I had friends to lunch. I served dal soup, which is cooked with mung beans, ginger, and turmeric. When one serves this, they are supposed to have fresh cilantro available to sprinkle into the soup. I forgot to put out the cilantro. 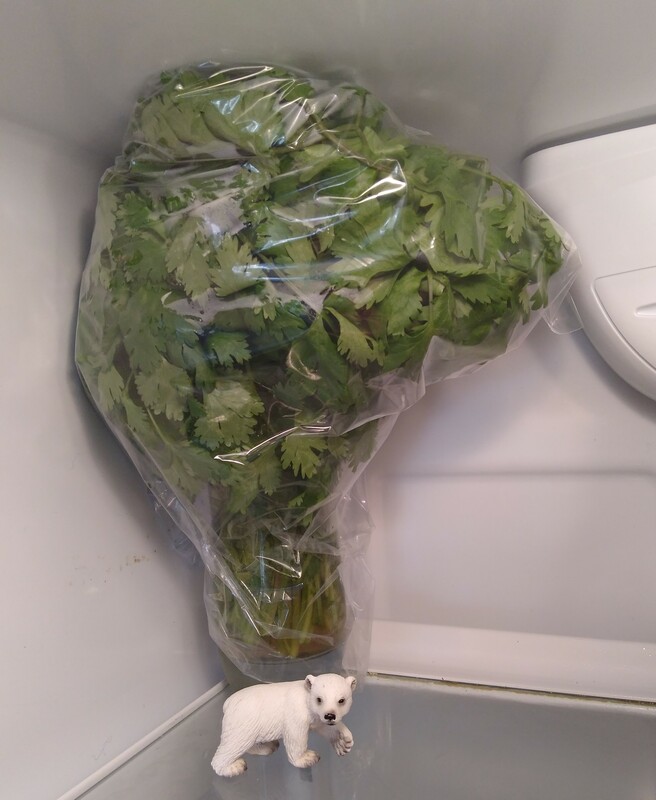 If you need cilantro today, I have some. Why “Mindful Chickens”? We are frugal so that our retirement savings will last as long as we do. At the same time we try to consume responsibly so that our choices have the least negative impact on our fellow humans and on our earth and its creatures. Cheep, Cheap!